protect and improve the soil and water on your farm, and beyond. If you are interested in implementing a best management practice on your land, contact our office today! For information on Soil Testing, please visit the Additional Resources page. The Ohio Working Lands Buffer Program encourages producers in the Western Lake Erie Basin Watershed to establish year‐round vegetative cover on eligible cropland. The program promotes the conversion, establishment and maintenance of forage/hay land on certain cropland acres. As the name implies “Working Lands Buffers” act as a buffer on cropland and provide another line of defense to filter surface water while allowing participants to harvest forage from established areas. For more information you can review the program guidelines here, or contact the Lucas Soil & Water Conservation District. Receive annual payments for maintaining established forage. Ability to harvest hay and forage from your Working Lands Buffer. Improved soil health with year‐round conservation cover. Working Lands Buffers provide conservation benefits while maintaining agriculture production. Working Lands Buffers are a visual demonstration of your commitment to land stewardship. Click Here to Review the Criteria for Working Lands Buffer Seeding, Establishment, & Maintenance. Do you farm in the Heilman Ditch Watershed of Swan Creek? ​Please Note: This project or publication was financed in part or totally through a grant from the Ohio Environmental Protection Agency and the United States Environmental Protection Agency with the following funds: Great Lakes Restoration Initiative. The contents and views, including any opinions, findings, or conclusions or recommendations, contained in this product or publication are those of the authors and have not been subject to any Ohio Environmental Protection Agency or United States Environmental Protection Agency peer or administrative review and may not necessarily reflect the view of the Ohio Environmental Protection Agency or United States Environmental Protection Agency and no official endorsement should be inferred. 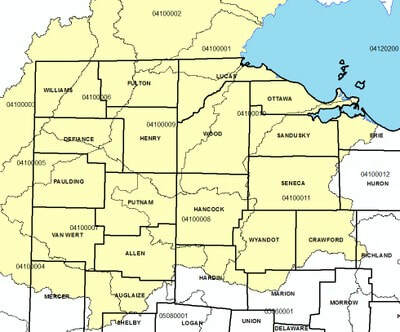 New rules are in effect for farmers in the Western Lake Erie Basin. ​ Click here to read the rules that are now state law, and here for the 48-hour weather forecast that limits when it is legal to spread fertilizer or manure. If you have questions or if you believe there has been a violation of Senate Bill 1, please call the Lucas SWCD office. Remember to check the local forecast before you apply!